As reported on TUW several weeks ago, sad news has been received that Gertan Klauber, who played the village waiter in "Do Not Forsake Me Oh My Darling" sadly passed away in August 2008. 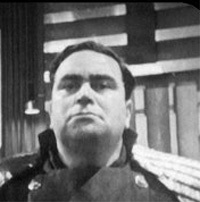 Also famous for his roles in series such as "Doctor Who" and "Blackadder", he will perhaps most fondly be remembered for his many "Carry On" film roles. TUW extends it's sincerest sympathies to all who knew him. With thanks to Simon Coward for this news item.